If you study old maps you will be aware of the number of ponds which used to be features of the countryside and which now have disappeared under housing and other development. Thundersley had its share of ponds, most of which survived well into the twentieth century, including the two on either side of the Daws Heath Road. 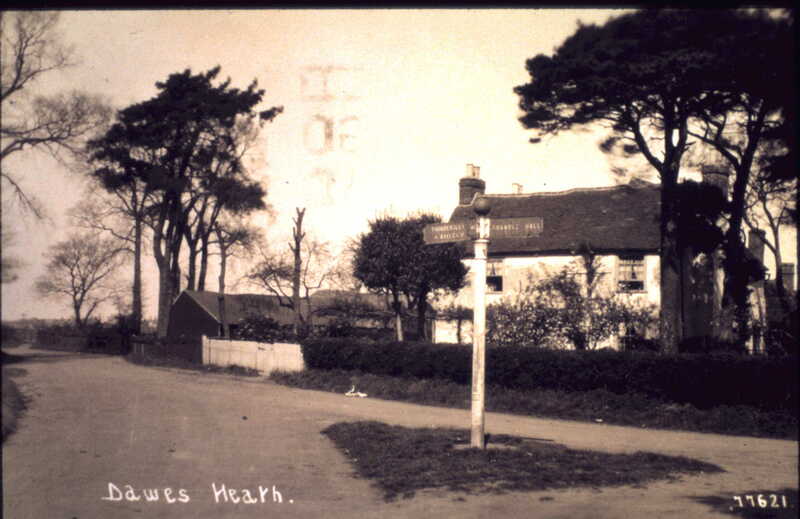 In the nineteenth century and earlier as you walked up what is now Western Road, which then would have been a steep track on the left hand side of the Daws Heath triangle, you would have become gradually aware of a large farmhouse in front of you at the top of the hill. This was Great Wyburns Farm, a very ancient farm with possible Anglo Saxon origins. At this point, just as we do today, you would have had to bear left. On your left at the bend you would have passed a decent sized pond. This was known to postcard photographers as Daws Heath Pond. After a few yards further progress another pond would have been visible on the right. This was the pond which stood in Great Wyburns farmyard, and for present purposes I shall call it Wyburns Pond. Daws Heath Pond lay where today the two bungalows stand to the left of Ann`s Mini Market. Wyburns Pond was more or less opposite Ann`s and just behind the current nature reserve fence and to the right of the kissing gate entrance. 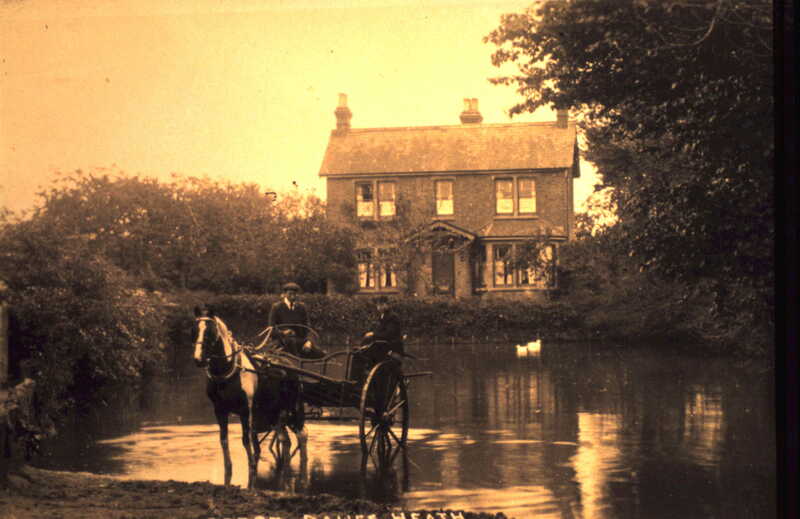 Graham Cook has already published one of the photos of Wyburns Farmhouse and the Daws Heath Pond [see Daws Heath: A Place for Vagrants and Vagabonds]. The three photos below show different aspects of the same place. The photo provides a view looking south. The large house standing on the far side of the pond was called Inglewood and stood at right angles to Western Road. In this photo Inglewood and the Daws Heath Pond can be seen on the right. 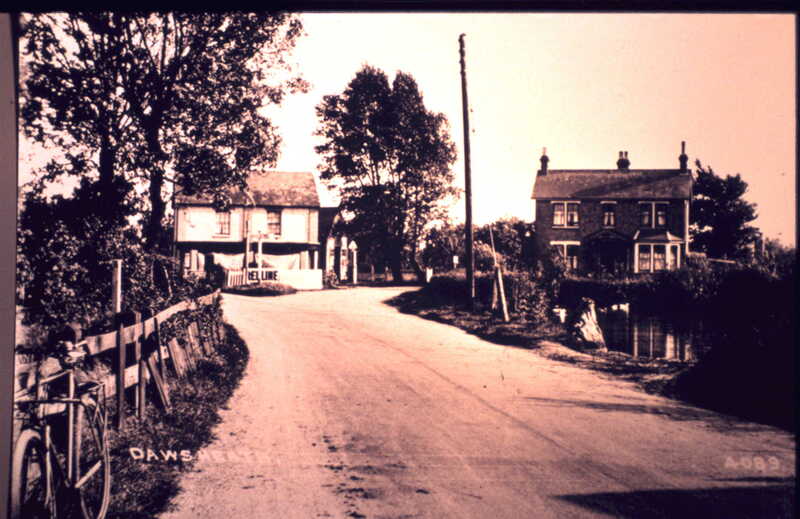 This corner where Western Road and Daws Heath Road met was known as Clark`s Corner. Mr Clark owned the petrol pumps and the general stores behind the signpost. Clark`s building much altered still stands today and now consists of a pair of semi-detacheds. Many of us remember that at one time not so long ago it was an off licence. The fence on the left belonged to Wyburns Farm. Spot the bicycle! This photo provides the opposite viewpoint to the previous photo. We are looking from Clark`s shop down the Daws Heath Road towards the Woodmans. On the right is a splendid view of Great Wyburns Farmhouse. The Wyburns Pond lay close to the road just behind the furthest buildings. I think my house is built on this lake, does anyone have any pictures of this area after the lake was filled in? Roger Shinn mentions the girl who drowned in the pond. This from my book: ‘Jessie Payne, in a book recalling stories of supernatural phenomena, reported that ‘many hundreds of years ago’ a farmer’s daughter at Upper Wyburn’s Farm, Daws Heath, was so beside herself with grief when her father refused to let her marry the man of her choice, that she threw herself into the farm pond and drowned. Since that time, several sightings of the girl have been reported.’ Her ghost seems to have given a party of travelers a good fright in 1917. Thank you, Roger, for your interesting memories. Over the years I have heard similar tales to yours from other Daws Heath and ex-Daws Heath residents. Do you know or are you able to recall roughly when the Daws Heath Pond was filled in? Everyone I ask has a different idea of the date. As a lad I was scared to go anywhere near the Clarks corner pond. It looked very black and deep and I was told that a girl had drowned there. I spent a lot of time with friend Roli Cook, sitting on the long log in the pond opposite Ann’s, netting Greater Crested newts and common newts. We would keep them in a jam jar until we headed for home and then let them go. Both ponds are long gone, I walked past the newt pond last week and still thought about the good old times in the area. Do You Know of a Plotlands Railway Carriage at Borrowdale Road Thundersley? Hart Road and Swans Green..
Hidden Buildings Next to Hadleigh Reservoir? King John's Lodge on Kingston Way? What's New at Hadleigh Farm?